Blog - Indian Spices: A Heritage For Yummy Dishes! Indian Spices: A Heritage For Yummy Dishes! It is a well-known fact that India is known for unity in diversity. The diversity cannot be judged by only natural landscapes, but it can be observed by different aspects of religions, traditions to culture and cuisines. Indian cuisines have a rich diversity, which is delicious as well at the same time. Spices are thankful for all these cuisines with great taste and aroma. Aromatic flavor of an exciting variety of quality spices contributes to the strong taste of Indian dishes. This is why India is widely known as the homeland of thousands of spices utilized all over the globe. High quality and unique flavor are the signatures of the spices that are easily obtainable at different places, even at online stores. When it comes to the major ingredients of dishes in India, spices are on the top of the list. They add not only flavor but are also helpful to give coloring to the dishes. If you just use the small proportion, even it can bring a heavy change in the taste. To make sure the authentic aroma and taste, a fine blending of spices plays an essential role. Black pepper: Helps in the improvement of digestion, promote weight loss, relieve cold and cough, treat skin problems and boost metabolic rate. Sabut Garam Masala: Aids digestion, metabolic rate, and skin issues. Cardamom: Better digestion, detoxifies the body, freshness of the breath, remove waste, and many others. Green and black cardamoms are two types that can be considered. Kebab Cheeni: Increases the blood flow, provides vitamins and antioxidants to the body, clear the skin issues, eliminate bacteria, prevent hair fall, and much more. Coriander Seeds: Stabilizes the blood sugar, blood pressure, and cholesterol, eases digestive discomfort, and combat food poisoning. Fenugreek Seeds: Enhances digestive and cholesterol levels, lessens inflammation, boosts libido and eliminates eating disorders. 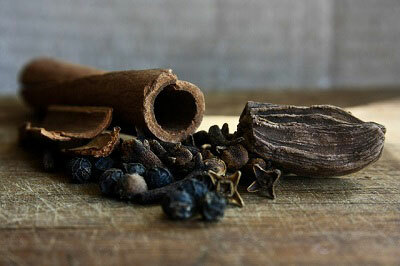 Other spices are Mace, Nutmeg, Cinnamon Bark, Dry mango slices, fennel seeds, Bay leaf, Caraway seeds and a lot more.